Another simple, flavorful, and healthy dish from Jaden Hair's Steamy Kitchen Cookbook. I served this with Coconut Shrimp, also from Jaden's book. These two dishes together were the perfect weeknight meal. They both came together in around 30 minutes, from stepping foot in the kitchen through sitting down to relax and dig in. Not counting, of course, the hour+ my adorable-beyond-belief yet inconveniently slow rice cooker took to do its thing. 1. Add the cooking oil, garlic, and ginger into a wok or large frying pan. Turn the heat to medium-high. As the oil heats up, the garlic and ginger will sizzle and infuse the oil with flavor. 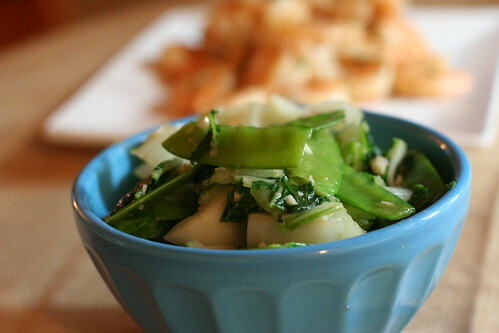 When the oil is hot (be careful not to burn the garlic and ginger), add the bok choy and snow peas. Immediately toss to coat the vegetables in the garlic, ginger, and oil. 2. Stir-fry for 30 seconds. Add the stock or water and oyster sauce and bring to a boil. Cover and cook for 1-2 minutes until the bok choy is crisp-tender at the stem. Drizzle on the sesame oil and serve. You know, every time I look at your page and see all the delicious food you make, I can't help but think of how lucky that hubby of yours is!! hahaha! But first I think of how badly I wish I was eating what you've made. Love it! This sounds like a fabulous meal, Amy. I especially love the vegetables. I love quick and delicious recipes! This looks amazing =D.